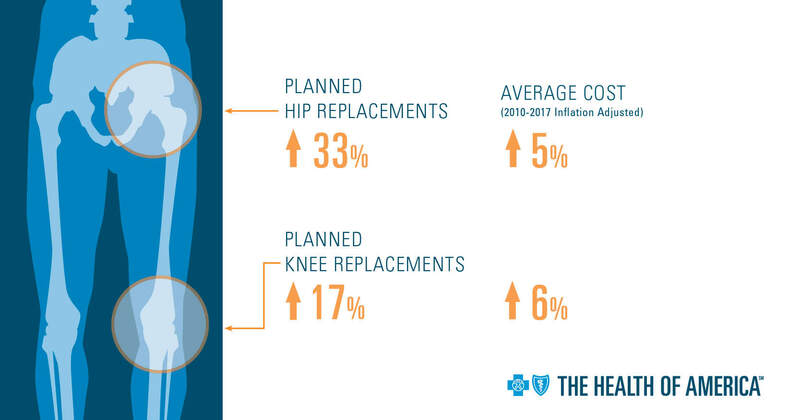 Planned knee and hip replacement procedures continue to climb in cost and volume, particularly among younger Americans, according to a review of medical claims data from 2010-2017 by the Blue Cross Blue Shield Association (BCBSA). Costing more than $25 billion nationally in 2017, planned orthopedic surgeries account for 47 percent of total orthopedic spending, reflecting a 44 percent increase since 2010. Knee replacements are up by 17 percent and hip replacements are up 33 percent. During the same time, the average price of knee and hip procedures increased by 6 percent and 5 percent, respectively. In the Philadelphia region, the surgical rates for knee replacements increased by 12 percent and hip replacements by 38 percent. The increase in the number of knee and hip procedures during this seven-year period is the main cost driver, as the number of knee and hip procedures has sharply risen across nearly all ages under 65. In the Philadelphia region, the average price for an inpatient knee replacement is $34,688. The average cost of an inpatient hip replacement is $32,771. The range of variation for these procedures from minimum to maximum is 146 percent for knee and 163 percent for hip. Nationally, knee and hip procedures performed in an outpatient setting are significantly lower in price than in an inpatient setting, at a savings of between 30 to 40 percent. Despite these potential outpatient setting savings, nationally only 11 percent of knee procedures and 8 percent of hip procedures were performed on an outpatient basis in 2017. In Philadelphia, 6 percent of both knee and hip procedures were performed on an outpatient basis in 2017. It is also critical that consumers have access to meaningful, credible information regarding medical practitioners. BCBS companies offer an array of transparency tools that provide standardized health care cost and quality information (including cost estimates, practitioner quality information, and access to patient reviews), enabling consumers to comparison shop for hundreds of common treatments and procedures. Members have access to consumer transparency tools on their BCBS company’s member portal or at the National Doctor and Hospital Finder. For more information, visit: www.bcbs.com/the-health-of-america. The Blue Cross and Blue Shield Association is a national federation of 36 independent, community-based and locally operated Blue Cross and Blue Shield companies that collectively provide health care coverage for one in three Americans. BCBSA provides health care insights through The Health of America Report series and the national BCBS Health Index℠ . For more information on BCBSA and its member companies, please visit BCBS.com. We also encourage you to connect with us on Facebook, check out our videos on YouTube or follow us on Twitter. Blue Health Intelligence (BHI) is the nation’s premier resource for data-driven insights about healthcare trends and best practices, promoting healthier lives and more affordable access to safe and effective care. BHI leverages a team of analytics experts and advanced technology, coupled with access to the greatest number of healthcare claims — 172 million lives — gathered over 10 years in a safe, HIPAA-compliant, secure database. The resulting conformed, reliable data set has the broadest, deepest pool of integrated medical and pharmacy claims, reflecting medical utilization in every ZIP code. Blue Health Intelligence (BHI) is an Independent Licensee of the Blue Cross Blue Shield Association. BHI is a trade name of Health Intelligence Company, LLC. www.bluehealthintelligence.com.